Don't know what to use your QR codes for? Check this out! Get creative by putting your QR code and the name of your adoption or personal fundraiser on a business card. Keep them in your purse or car in case you meet someone who wants to donate. Simply hand out the card and they can donate with their phone, or they can take it home and donate later. Who knows they may donate and share you card with someone else! missionaries we would highly recommend this as an option to you! Just think about all those support letters you sent out. Was it easy for people to donate? Could they simpley scan a QR code with their phone and setup monthly donaitons on their credit card? 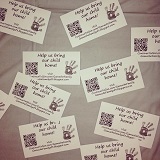 Make sure to use QR codes for easy missionary fundraising! Stay tuned for more ideas or submit your fundraising idea by email [email protected] to have it spotlighted in a newsletter!